Although the baby is lying on her side and the face cannot be seen, this image does show the leg and foot particularly well. 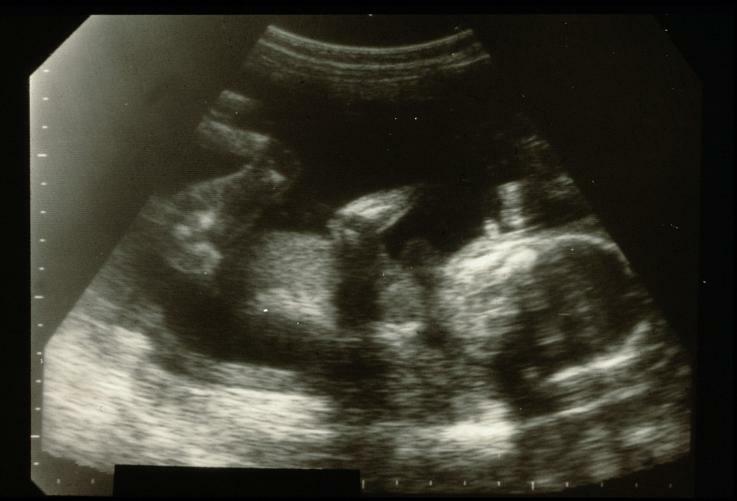 Because 2D ultrasound only shows a “slice” of the baby, parts may appear to be missing, such as the arm here which stops midway. It’s normal and healthy for you to gain more weight in the second trimester than in the early months of pregnancy. While you may have gained little weight in the first trimester, from the second trimester onwards you will gain weight each week. On average, women put on 1–2lb (approximately 0.5–1kg) per week from the second trimester to the end of pregnancy, though the weight gain tends to slow down in the last few weeks. The amount of weight you should be gaining depends on many factors, not least your starting Body Mass Index (BMI). The target weight gains are detailed below. Not all of the weight gained is the baby; in fact, the fetus makes up only a small part. The rest of the weight is accounted for by your growing uterus, amniotic fluid, breasts, and increased blood volume and fat. If you have any concerns about your weight, seek advice from your midwife. Your weight may not be checked routinely at your antenatal checkups, but your midwife will weigh you if she’s concerned about the amount of weight you’re gaining. I keep having hot flushes. Is this normal? Many women experience hot flushes during pregnancy as a result of increased levels of the hormone progesterone. This encourages the blood vessels to dilate – suffusing them with blood, and heat. What’s more, when you’re pregnant, your metabolism increases, causing extra heat to be produced. That’s not to mention the little heater that you have growing inside you. Wear layers that can be speedily removed and avoid eating spicy foods, and drinking alcohol and caffeine, all of which can encourage hot flushes. Exercise can help by improving circulation, and yoga, and other relaxation exercises, can help you to keep cool and calm. Your target weight gain for the second trimester is no more than 5.5–9kg (12–19lb), which is about twice as much as the target for the first trimester. If, due to pregnancy discomforts, such as morning sickness, you had a difficult first trimester and did not gain much weight, this is a good time to increase your calories to try to make up some of the weight gain. If you gained too much weight in the first trimester, focus on staying active, and filling your plate with lower-calorie yet nutrient-rich fruits and vegetables. Keep your target goal weight gain in mind. The recommended total pregnancy weight gain is 11–14.5kg (25–32lb) for women whose Body Mass Index (BMI) is in the normal range, between 20 and 25. If at the start of your pregnancy you were overweight, your total weight gain should be 7–11kg (15–25lb). If you started underweight, you should gain a total of 12.5–18kg (27.5–40lb). If you’re expecting twins, you should aim for a total gain of about 16–20kg (35–44lb).